This year’s Northumberland Congress, held at The Parks Leisure Centre in North Shields, was the 53rd such annual event (for many years it was called the Tyne & Wear Congress, by which name many of us old-timers still refer to it). Forest Hall players were prominent in all four competitions, with myself (Tim Wall) being lucky enough to finish second equal in the Open on 4/5, while Yichen Han won the Top Junior prize by scoring a very creditable 3.5 – one of his best results to date in an Open tournament, including a very good win over James Moreby in Round 1, and a draw against Scottish international Andrew Burnett in Round 4. 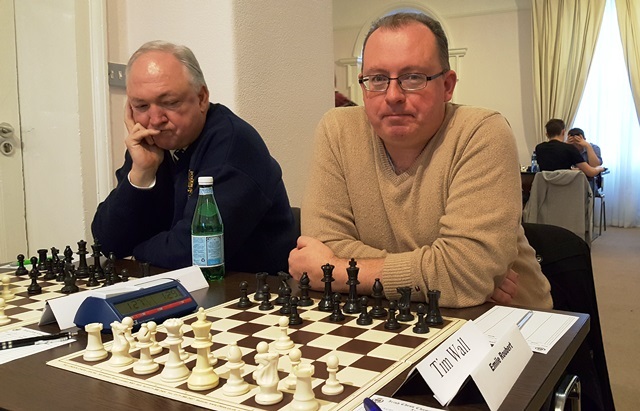 In the Major tournament, Mike Smith came 3rd equal with 3.5/5, and Johnny Wall won the Top Junior prize with 2.5. In the Minor, Ian Rook scored an excellent 4/5 to take 2nd equal, while Paul Charlton finished with 3. But it was the Foundation tournament that saw the biggest success for Forest Hall, as first-time tournament player Ciaran MacDonald scored an incredible 7/10 to take first equal. This result was all the more amazing when you consider that Ciaran, 11, just started playing chess two months ago – clearly showing that he has a natural talent for the game, and that the Forest Hall club junior coaching system is paying dividends! Open: 1st Andrew Horton (Durham University) 4.5/5, 2nd= Charlie Storey (Morpeth), Tim Wall (Forest Hall), Paul Dargan (Tynemouth) 4. Major: 1st Robert Clegg (Huddersfield), Stephen Ormerod (Darlington) 4/5, 3rd = Graham Ashcroft (Preston), Kevin Wilson (Darlington), Paul Robson (Durham City), Mike Smith (Forest Hall), William Clinton (Scotland), John Clarke (Tynemouth) 3.5. Minor: Robert Forsythe (Leam Lane) 4.5/5, 2nd = Paul Salisbury (York), Ian Rook (Forest Hall), Mark Couch 4. Foundation: 1st = Harry Wilson (Darlington), Frank Tanner (Blackburn), Ciaran MacDonald (Forest Hall) 7/10. In the following last-round game, I threw caution to the winds and unleashed a barrage of piece sacrifices to drag Nik Tavoularis’s king out into the open. Even though after the game I admitted that I hadn’t seen all the variations, my intuition (that there must be some kind of checkmate attack) turned out to be correct. Clearly, in this case, fortune did favour the brave! a) 4 Nc3 begins the famous gambit named after Armenian grandmaster Rafael Vaganian, who used it to devastating effect to score win after win in the 1970s. It is still regarded as a dangerous attacking weapon, so it’s a perfect choice for a last-round, must-win situation. b) 21 Qg3 shows White’s intention to go for a kingside attack, knowing that at some point his bishop may be trapped at h4. White figures that, with all his pieces (apart from the c3 knight) in the attack, chances are high of catching the king in a rabbit hunt. c) 23…g5 means Black is going for it! Only two outcomes are now possible: Either Black’s king will survive and he will win on material, or the attack will crash through and the king will perish. Both players were now getting short of time, and going for broke! d) 25 Rf6 begins the cascade of sacrifices. If 25…Rxf6 26 Rxf6, and White will break through to the king with Bxg5. Note how useless Black’s pieces on the queenside are – temporarily, his king is without protection and White’s pieces smell blood in the water! e) After 29 h4, White has sacrificed a rook and two bishops, yet there is no defence for the Black king. If 29…Bg4 it was wasn’t clear to me during the game how I was going to checkmate – but like Mr. Micawber in Charles Dickens’ ‘David Copperfield’ I assumed that ‘something will turn up.’ In fact, after 30 hxg5 Kxg5 White has a lovely checkmate with 31 Qe3+! (sacking yet another rook), as after 31…Kxf6 31 Qh6 is what is called an “epaulette mate”, as the Black pieces at e7 and e5 prevent his escape. f) After 29…Ng7, 30 Qg7! is a classy finish. If the rook is captured, it’s 31 Qg5 mate, and otherwise there is no way to avoid mate on h6.